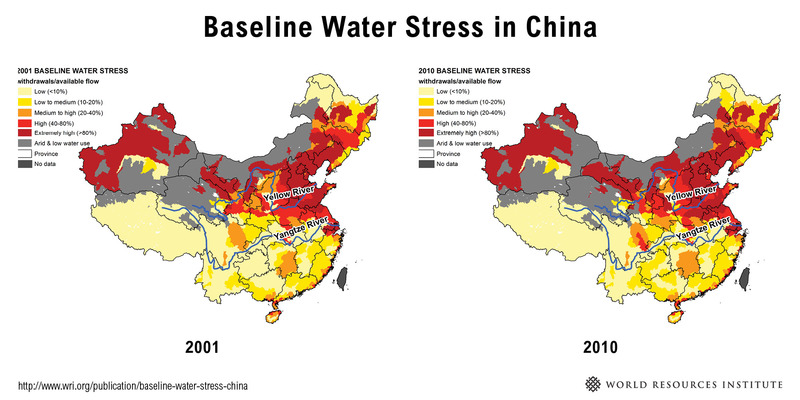 Using the baseline water stress metric developed for WRI’s Aqueduct Water Risk Atlas, we compared water stress in China between 2001 and 2010, the latest year for which catchment data are available. This analysis paints a much more accurate picture than previous analyses, using detailed freshwater withdrawal data from more than 300 prefectures and high spatial resolution grid data. 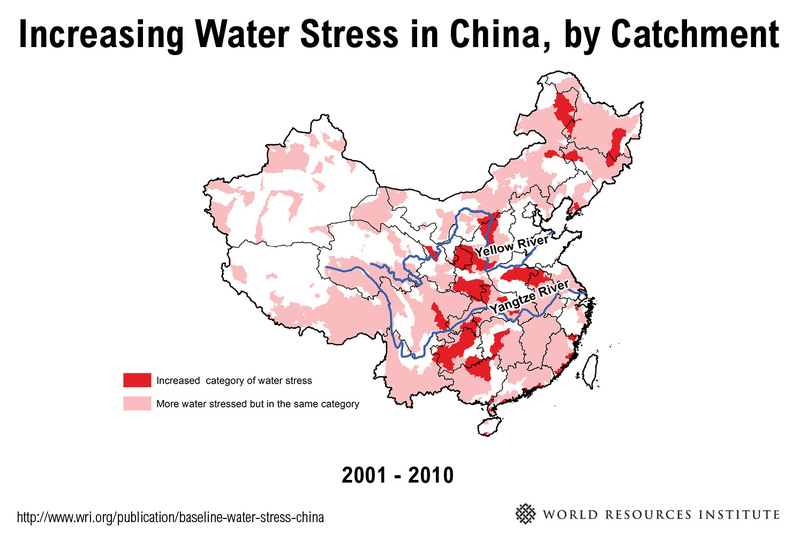 We found that the percentage of land area in China facing high and extremely high water stress increased from 28 to 30 percent, meaning 678 million people now live in highly water-stressed areas. What’s Driving Increased Water Stress? There are several reasons behind the worsened water stress situation for these catchments, but industrialization and urbanization are two of the biggest. Industrial water withdrawals increased in all provincial divisions except Beijing. For example, one catchment in the Yellow River Basin—where water stress increased by 55 percent—is near one of the country’s national coal bases. Extraction and refining of coal is a very water-intensive process. In the Pearl River Delta, one of the major economic zones in China on the southeastern coast, industrial GDP increased 4.8 times, while urban population grew by 56 percent from 2000 to 2010. In Guizhou Province in the southwest, industry grew significantly while the urban population increased by 22 percent from 2001 to 2010. Most areas in China also experienced an increase in domestic withdrawals, mainly due to population growth and improved standards of living. In catchments with increased domestic water withdrawal, more than 80 percent saw an increase in domestic water withdrawal per capita. With income growth, more families can afford household appliances like dishwashers and washing machines, and live a higher-consumption lifestyle. For example, the number of washing machines per 100 households increased from 90.5 to 96.92 during the 10-year period studied. The number of shower water heaters per 100 households increased from 49.10 to 84.82.